What is it about this street in Lachine that attracts me to sketch here? It’s probably a combination of things. First of all, there’s the mysterious perspective that pulls you in and makes you wonder what’s lurking on the other side of that hill. Secondly, it’s the shape of the sky formed by the buildings — a shape that’s broken up in an interesting way by the utility poles. Thirdly — and this is something I only realized after I scanned the sketch — is the pattern of wires that knit both sides of the street together. And the last reason is one I’ve talked about before, when I painted in this spot for the first time in 2012. If you are curious, you can read about it here. Ahh, that yellow sky. It’s exactly right. Thanks Alice. It’s sometimes hard to get the right balance with a yellow sky. This one is mostly Raw Sienna with just a bit of Azo Yellow. I am enjoying the tight color palette, and the echoing of the electric wires in the street cracks and patches. Not to mention the extremely unusual composition. Those utility lines are not that hard to do John. Just look at how they break up the sky. That’s the easiest way to see them. Nice work… it makes you wonder where is the road going to? What is out of sight over the hill? I never put into words why I like the painting but maybe it is for the reasons you listed. Thanks! Nice sketch… I always think that your power lines are so important for these compositions… they “tie together” the top of the sketch. Now, it would be really interesting to see the composition before and after power lines… but I think that is a problem as, if I recall correctly, you usually do all the linework first, is that right? Yes, what an intriguing hill, what a hopefully sky and what a gleaming asphalt! Blown up!! (I feel as if I am inventing words in English to be understood). Félicitations (would be more secure)! Merci Richard. Invented words are fine for me. I probably do that too sometimes, even in my mother tongue! 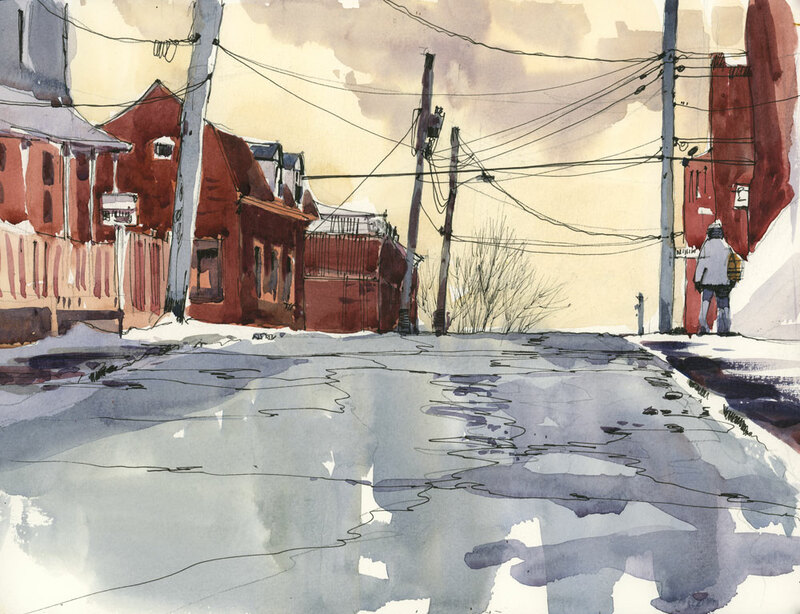 Love the cold wet street and the suggestion of warmth in the sky…a great little painting! not to mention the sky. Love it. 25th and Notre Dame. Really interesting story, Shari. Going our today to find “my street.” Thanks for all of the inspiration you give us. I look forward to seeing what your street will be Lee. I’m scratching my head over where that is in Lachine! Of course, Lachine is a lot bigger than Ville St. Pierre which is the part that I know, and I know you like St. Jacques in VSt.P. It is always special when you paint something that is familiar to the viewer. Nice wet road, sky, and I love the power lines too.